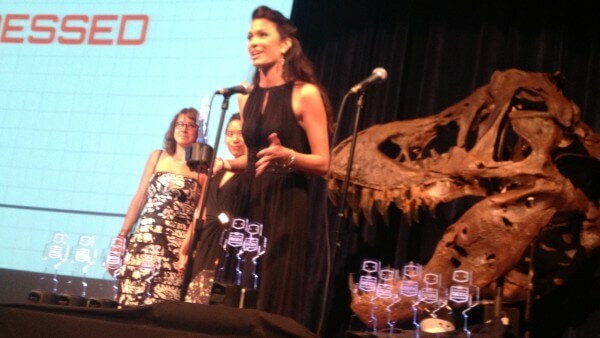 On Saturday night, Digitability was named Startup of the Year at the Philadelphia Geek Awards. The awards ceremony, hosted annually by Geekadelphia and the Academy of Natural Sciences of Drexel University, honors geeks in the greater Philadelphia region. The types of geeks recognized range from local game developers to comic book artists, social media marketers to the arts & culture community. "It's our mission to make sure that one day, an individual with autism is up here accepting this award for something amazing that they accomplished." said Founder, Michele McKeone while accepting award. Digitability is honored to have received this award and be recognized its work helping individuals with autism reach their potential. Digitability strives to bring attention and advocacy to improving opportunities for learners in today's technology driven landscape. Other winners of the evening include: Scientist of the Year, Kimberlee Sue Moran; Geek Story of the Year: PONG on the Cira Centre; Mobile App of the Year: BizVizz; Hacker of the Year: Dr. Frank Lee; Visual Artist of the Year: Braille Street Art; Indie Game of the Year: Perfection (Greg Lobanov); Feature Length Indie Film of the Year: The Backyard Philly Project; Viral Project of the Year: We Are Never Ever Going to Win with Andy; Web Project of the Year: AxisPhilly; Comic Creator of the Year: Andrew Goletz; Social Media Campaign of the Year: #GunCrisis; Event of the Year: Open Air Philadelphia; and Geek of the Year: Dan Ueda.